If you are not already a subscriber to the world’s best mobile photography magazine – Mobiography – then there has never been a better time to do so. 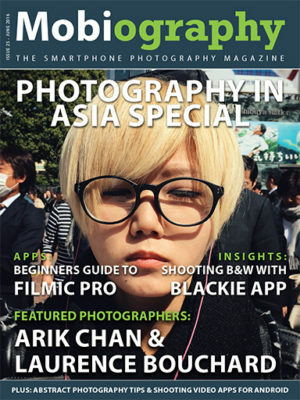 Some excellent features in this issue (including one or two by myself), which highlights some of the great mobile photographers in Asia. People like Laurence Whatley and Arik Chan. There is also a feature on Monogram Asia and how they are contributing to the photography world. This entry was posted in iPhone, Street Photography and tagged Brendan Ó Sé, Brendan Ó Sé Apple Photo, Brendan Ó Sé photography, Brendan Ó Sé workshops, mobiography, Monogram Asia.